Anyone familiar with the history of climbing in the U.S. is aware of the contributions of Pat Ament in terms of climbing but perhaps even more importantly for a new approach to climbing culture as seen in his books and films. 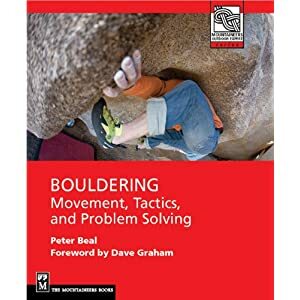 I asked Pat a few questions about the history of bouldering at Flagstaff and he very graciously replied at length with great stories and details that evoke a now-vanished time. I present the first part of the interview here; the second will be posted shortly with stories about John Gill and much more. Thanks Pat! 1. How did you start bouldering at Flagstaff? I don't remember the first time I visited Flagstaff Mountain, but it was certainly very early in my career, probably in about 1959. One of the first memories I have was with Joe Fullop, who wanted to teach me how to climb. To make that story short, Joe set up the rope to make the rappel off the overhanging west side of Pumpkin. I started off the edge, with great reluctance, lying there and scraping my whole front side as I went over. Just off the edge, I saw a ledge to the right and somehow stepped onto it. I don't know, to this day, how I managed to get standing on that ledge (because since then I tried to repeat the maneuver, as an experienced climber, and couldn't do it). Anyway, to resume the rappel I would have to swing back left, and the idea of the swing made me freeze. I wouldn't move for hours. Joe yelled and threatened, exasperated. Baker Armstrong, forty years my senior (I was 13) happened along, through the forest. He instantly recognized the situation and, an experienced and very gifted instructor, scrambled quickly to the top. Suddenly a loop of his gray-whie Columbian rope was lowered to me. He told me to slip it around my head and arms, and he made me feel safe enough to continue. That was the beginning of an eternal friendship, with Baker. I think I went to Flagstaff often after that, with one of the "rock schools" I first participated in as a student and then for which I became an instructor. It didn't take long to become a real boulderer, though when I was fourteen I fell off Pratt's Overhang one night. Larry Dalke and I found ourselves up there after dark, when our parents agreed to have a picnic dinner. Larry was spotting me, as I attempted this challenging, overhanging boulder. I was over the hardest part and got standing up on the big horn, which meant all I had now to do was walk over the top and traverse down the descent. Larry saw I had made it and walked away, when suddenly I found myself on my back, on the ground, and the stars were spinning around. I started to say, "Nice catch," but I couldn't say a word. It was that horrid feeling of when the wind is knocked totally out of you. I got up, walked around a bit, then fell back down, in agony. Larry started pushing on my chest, a form of artificial respiration, and surprisingly it worked. I got to breathing again, and panic on both our parts turned to uncontrolled laughter. In the morning, I woke up and had a fierce pain in my wrist. It was stiff as a board, and an X-ray revealed a fracture. I must have hit it on the ground when I landed, or on the big round boulder that sits there at the bottom. Flagstaff Mountain... a place I spent many hundreds of hours bouldering, often during the later 1960's all by myself in the evening as the sun would go down. I was the most serious boulderer in Colorado for years, apart from John Gill -- who first moved to Fort Collins and then to Pueblo. He and I also became lifelong friends. I must have done fifty or more of those routes over a hundred times each. 2. Can you describe the ambiance of bouldering at Flagstaff in the mid-1960s? The atmosphere of Flagstaff, during my prime in the late 1960's, was not terribly unlike what it is today, although there were far fewer people and far fewer serious boulderers. I often had the whole mountain (or at least the bouldering areas) all to myself. I have precious memories of standing up there at the start of some problem and hearing a slight wind in the pines. I would notice the color of the clouds. It seemed the rock itself, that fragile sandstone with which I was so intimate, had a spirit and was alive. It almost seemed to welcome me as a friend. I listened to the sound of a block of chalk, as I brushed it against my fingers and palms. I felt there was some kind of communication between myself and the whole environment. It was very nice to be up there alone. I could set my own standards. I had a high standard and, for example, climbed that direct South Face route in the Flagstaff Amphitheater without a rope. There was no spot, no top rope, only my ability and control. I reached a point where I could smoothly climb the Right Side of the Red Wall, hold in with my left hand and arm, with the fingertips of my left hand in that finger-tip hole. I felt those were days of mastery, but within my own world. No one else would know or comprehend what I had done or was doing. Thanks for getting this interview. I've only been bouldering at Flagstaff for a few months now, but the history of the mountain is pretty amazing. I love hearing first hand accounts from people like Pat who were some of the pioneers of our sport. I can't wait to read the rest of the interview. Peter, that's excellent to see some words from Pat. Thanks, and I look forward to part two.